Okay, Talking Points has gotten a touch earnest lately. So let’s lighten it up a bit. Let’s run down the official Talking Points Top Ten list of reasons why the Senate should reject Bush’s nomination of Ted Olson to be Solicitor General. So, Anton, a drum roll please …. 10. 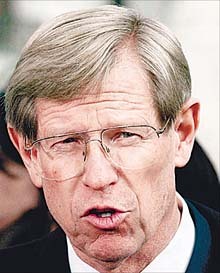 Made his legal career attacking and dismantling federal environmental and anti-discrimination laws. 9. Successfully argued one of the greatest miscarriages of justice in American history. 8. Just squints too damn much. 7. Too big a buds with Kenneth Starr. 6. What would be big polluters and tobacco companies do without him? 5. Helped prep the Paula Jones legal team for their appearance before the Supreme Court. 4. One degree of separation from former federal prosecutor/Clinton-hating freak/Dan Burton crony/Hillary-bashing author Barbara Olson is just too close! 3. Spent mid-1990s organizing and overseeing multi-million dollar anti-Clinton dirty tricks campaign called the Arkansas Project. 2. Because it’s the right thing to do. 1. ‘Cuzz it would just feel so damn good. P.S. This Top Ten list is so damn good won’t you please give me the exact link so I can forward it to my peeps? Sure, my pleasure … click here. P.P.S. Hey, did I miss any? If you think so, send your reasons here. We’ll post the best. (Say whether I can use your name, or no).